Cashmere, mohair, angora, sequin, eyelash fringe, and faux fur: these are the most luxurious and expensive yarns, often too costly to use for a knitting project of any great size. But these 35 breathtaking items are small enough that knitters can afford to indulge in the finest materials, and easy enough for beginners to complete with ease. 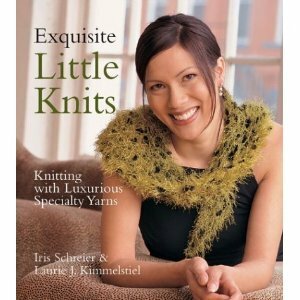 Thumb through the exquisite photos of each specialty yarn, complete with descriptive introductions to its unique qualities and advice on how to work with and care for it. Follow the short and simple instructions to make a long scarf with bouclÃ© trim, a snazzy flapper-style hat from a mohair-silk blend, and the ultimate pashmina shawl. Each item is dramatic and unique. Both authors live in White Plains, NY. Authors: Iris Schreier and Laurie Kimmelstiel.